Maintaining a healthy, energetic body is of primary importance on a spiritual path. Sprouts are easy to grow and a source of pure life force and dense nutrients you can't buy. Bring More Peace, Harmony, and Well-Being to Yourself, Your Family, and the World! Learn how to safely release negative energies from your home using a powerful technique. Advanced Training to join the world-wide effort: Sept 28. The Spirits of great mountains around the world have put out a call! We have the monumental opportunity to hear what they have to say in this event. Six-week webinar on the care and protection of your energy field, skills that are absolutely essential as energy sensitivity is developed and awareness is expanded. Prerequisite: Optimal Human Beingness. Empower yourself and receive healing tools from Divine Mother in this life-changing initiation. Join a wonderful group of lightworkers. 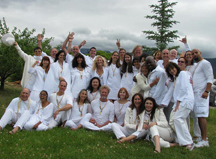 A special 3-day workshop and transformational journey! A new etheric retreat is being developed in the valley, and will have its grand opening on the solstice. Learn to communicate with nature spirits, and how to use the four elements of nature in your life. Center for Soul Evolution is a nonprofit organization. Congratulations to the initiates and thanks to the volunteers who made this annual gathering so special! We are excited to offer many webinars in the next few months, so you can train from your home. But we also hope many of you will join us in person for the Death Valley Retreat on the winter solstice! We now call it Valley of Emergence because of the transformational energy there, and it must be experienced in person! And remember, if you are coming to the Mount Shasta area please schedule time in the Mt Shasta Pyramid well in advance. It is such an amazing space.